Kim Dotcom, aka Kim Tim Jim Vestor, aka Kim Schmitz, doesn’t act much like a man with a net worth in the negative. At 11 am on a Tuesday he’s driving me around on a golf cart “safari” of his 60-acre estate outside of Auckland, New Zealand. We swing past his 2,000-bottle-a-year vineyard and barrel down a hill toward his $30 million mansion, complete with a hedge maze, a five-flatscreen Xbox room and a 75-foot cascading water display. Given that he owes millions of dollars to defense lawyers and now has to raise his five children on a $20,000-a-month government allowance meted out from his frozen bank accounts, wouldn’t it be wise to live a slightly simpler life? The “stunt” Dotcom refers to is the police helicopter raid on his compound that made global headlines 15 months ago, timed to coincide with the US indictment that shut down his ultrapopular constellation of Mega-branded websites under charges of hosting half a billion dollars’ worth of pirated movies and music. Overnight Dotcom went from an underground entrepreneur to one of the most public and controversial figures on the internet. His site domains, including the flagship Megaupload.com, are now the property of the US government. His servers have been ripped out of data centres around the world and sit in evidence warehouses. He’s had to let go of 44 of his 52 house staff as well as Megaupload’s hundreds of employees. All but two of his 18 cars have been seized or sold. 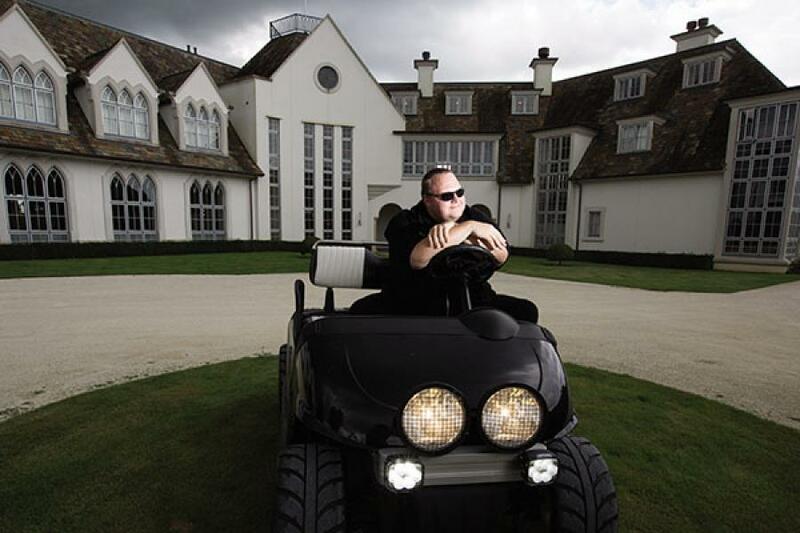 But today Kim Dotcom is putting all of that in his souped-up golf cart’s rearview mirror. His new storage startup, called simply Mega, launched January 20. It’s already exploded to exceed 3 million registered users. His engineers tell me it’s moving 52 gigabits of data per second—that’s nearly half the entire bandwidth of New Zealand—and growing at 30 percent a week. The traffic has been driven in part by Dotcom’s own larger-than-life persona: An internet mogul who doubles as either an intellectual-property-stealing supervillain or an oppressed freedom fighter, depending on whom you ask. Either way, Dotcom has learned from his legal misadventures and promises that the copyright cabal will find this company much harder to snuff. Mega is “the Privacy Company”. Unlike Megaupload, everything sent to Mega is encrypted. No one can decrypt those scrambled files except the user—not the FBI, not the Motion Picture Association of America, not even Kim Dotcom. Mega claims to keep the eyes of both authorities and snoops off its users’ files, a libertarian ideal that fits neatly into Dotcom’s personal narrative as a victim of the US government’s overreach into the digital world. The revenge Dotcom is planning, he says, will be twofold: Not only will his new, better company be immune from his enemies, but he also hired a team of 28 global lawyers who he believes will make the US government pay for treating the internet as a subjugated colony. In 2009 a study by traffic-research firm Arbor Networks and the University of Michigan found that a little-known collection of sites was responsible for a gargantuan amount of the internet’s data—their hosting firm was using twice as much bandwidth as Facebook. The sites, including Megaupload and Megavideo, seemed to have been registered in 2005 to one Kim Schmitz, a German ex-hacker and ex-con. But a spokesperson at Megavideo told Forbes at the time that no person by that name was associated with the company. “Technically that was correct,” says Megaupload’s 39-year-old founder years later. In 2005 Kim Schmitz had legally changed his name to Kim Dotcom, and he saw no need to reveal his new identity to a nosy reporter. DOUBLING DOWN Facing decades behind bars if extradited, Dotcom vows he “will not spend a day in a US jail”. Learning from the hackers who inhabited his forum, Schmitz developed a knack for breaking into corporate telephone switches known as PBXs to hijack modems that could be used for free internet connections. Using the nom de guerre Kimble, he bragged to Forbes in 1992 that he had compromised more than 500 of the systems. Schmitz was soon busted by German police for a scheme that earned him $50,000 by funneling hacked PBX traffic to a paid bulletin board service he’d set up in Hong Kong. After two years of probation Schmitz leveraged his hacker reputation into a security business that he later sold to the German technical conglomerate TUV Rheinland. He rose to prominence as a flashy dotcom investor, throwing lavish parties, renting yachts and winning a round-trip cross-continent road rally from London to St Petersburg in his custom Mercedes Brabus. But in 2002 Dotcom was hit with insider trading charges over his role in a Groupon-like company called Letsbuyit and pled guilty. With his reputation tattered in Germany, he fled to Hong Kong and changed his name to Kim Tim Jim Vestor, swapping first names on a whim. Kim’s new scheme, and the one that would become the most lucrative of his career, arose from a simple problem on the pre-YouTube internet. There was no easy way to attach video files to email, such as clips of his road rallies. So he, his old hacker friend Matthias Ortmann and Bram Van Der Kolk, a fan from his racing days, created Megaupload as a no-frills data storage and video service. The Hong Kong-based company was soon doubling in user adoption on a yearly basis. 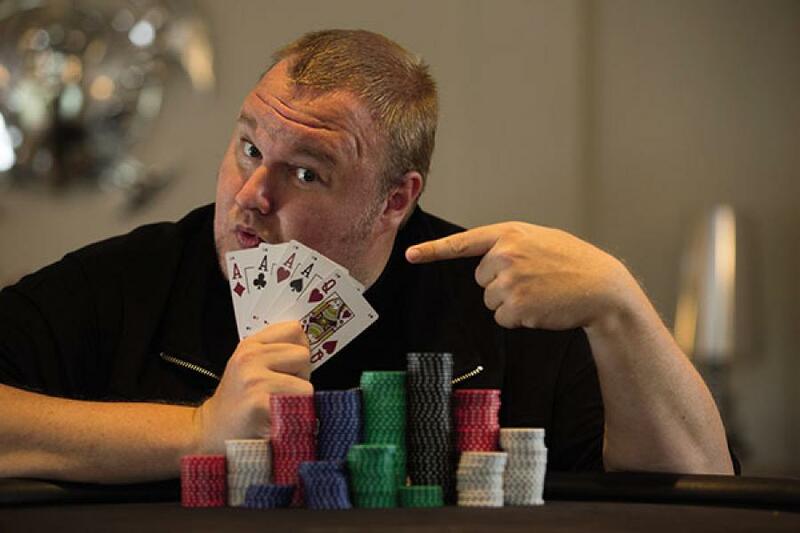 The then 34-year-old hacker from Kiel changed his name a final time to reflect his new digital ambitions: Kim Dotcom. Dotcom began renting the top floor of the Hong Kong Grand Hyatt and made frequent trips to the Philippines, where he recruited offshore staff and met his wife, ex-model Mona Verga. Soon, he says, he employed 12 people in Hong Kong, 90 in the Philippines and dozens more in Germany, Mexico, Brazil, Britain and Portugal. As Megaupload grew, an ecosystem of illegal services began to form around it. Sites like Surfthechannel, Quicksilverscreen and FilesTube began to catalog entire seasons of copyrighted TV shows, pirated music and movies on Megaupload. Dotcom says he was careful to abide by the US’ digital copyright act (called the DMCA), which required that his sites take down infringing content after it’s pointed out by the content’s owner. But the files often reappeared within days. Still, Dotcom’s sites were used for legal file storage and sharing, too. he was confident that his business was sheltered within the DMCA’s safe harbour, which puts the onus on the copyright holder, not services like Megaupload. By 2011 Megaupload had become an internet behemoth, pushing 1.5 terabits per second of bandwidth at peak times. According to the Department of Justice, the company generated $175 million in sales over its lifetime, mostly from premium accounts (the feds say Dotcom personally pocketed $42 million in 2010). The site had 150 million registered users, and Dotcom planned a public offering—he expected to give it a valuation of more than $2 billion. With his 65 percent stake in the company he would be a billionaire. Then, a day before his 38th birthday, the US government took it all away. The 72-page federal indictment unsealed in January 2012 alleged that Dotcom, Ortmann, Van Der Kolk and four others had taken part in what it dubbed the Mega Conspiracy. It set off a firestorm. The hacker group Anonymous went on a revenge rampage, launching cyberattacks against the Justice Department, FBI, MPAA and Universal Music websites. The digital rights group Electronic Frontier Foundation launched MegaRetrieval, aimed at getting legitimate users of the site their data back from the US government. Over the next months the prosecution would make serious missteps: A New Zealand court found that evidence in the case had been illegally transferred from Auckland to the US. And it soon became clear that New Zealand’s extradition treaty didn’t cover copyright infringement; the US would have to prove in a Kiwi court that Megaupload staff had engaged in a mafia-style criminal conspiracy that violated RICO law. Finally, New Zealand’s spy agency admitted it had illegally surveilled Dotcom’s home, forcing the prime minister to issue a public apology. Meanwhile, Kim Dotcom was going on the offensive. While briefly in a New Zealand jail, Dotcom and Ortmann began brainstorming a plan for a new company. Its secret weapon: Ubiquitous encryption. Ortmann, who had been visiting Dotcom for his birthday when the raid occurred, was now legally trapped in New Zealand. So he moved in with Van Der Kolk, and in September 2012 they began to code the new site. The site was launched in a bombastic event at the Dotcom Mansion, complete with Maori performers and a parody of the police raid. Mega offered users 50 gigabytes of storage for free, compared with 2 GB from Dropbox, 5 from Google or Apple, and 7 from Microsoft. Within 24 hours the site claimed a million users and is on track to bank millions from premium accounts in its very first year. The service offers privacy features few have dared to try. When a user signs up, a pair of cryptographic keys are generated in the browser that effortlessly encrypt and decrypt files—no downloads required. Whether that browser-based encryption can stand up to sophisticated crackers has long been a subject of controversy in the cryptography community. But the company’s main concern may not be protecting data from spies, so much as from itself. Its encryption setup means it can’t be held responsible for filtering copyrighted content, skirting the DMCA’s legal ambiguity. “All that matters is Mega’s ability to plausibly claim they don’t have any way to identify copyrighted material on their servers,” says cryptographer Moxie Marlinspike, a former director of product security at Twitter. Browser-based storage is only the beginning for Mega. Mobile applications for Android and iOS are coming soon. By the end of this year Dotcom says he’ll offer encrypted email and text messaging and, later, encrypted voice calls to compete with Google and Skype. And he’s also incubating plans for a Spotify competitor called Megabox, a service for original music that lets the artist keep 90 percent of the revenue. He claims he’s planning a Mega IPO on the New Zealand stock exchange next year. As we sit on his mansion’s patio beside the pool, Dotcom considers his future, and his mood darkens. “We’ll sue the US government. … We’ll destroy the studios that triggered all of this with misinformation and corruption,” he says. “Someone will pay. I won’t settle for a handshake and an apology. And I will not spend a day in a US jail.” He follows with one of his many racing tales: In the 500-metre final stretch of the 2004 road race that began in Morocco and ended in Cannes, Dotcom and his co-pilot Ortmann hit a traffic jam on Cannes’ main drag, the Boulevard de la Croisette. And God help anyone who’s in his way.